Check out our portfolio of jobs below! Obviously not every job we've ever done is listed - we just highlight the ones we think are the most interesting. Feel free to leave comments or ask questions. We love hearing what you think. 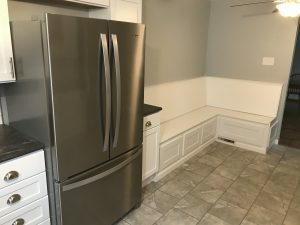 Our crew remodeled this kitchen! All of the staff of T & H Keith, Inc were very helpful in the process. I always have questions (whether they are good questions or not), they were all answered respectfully and given additional advice. I like the “wow” factor…checking out the finished project. I can’t express enough how much I appreciate the way you operate your business. I like happy people! If they are happy than I know they like their work. I mentioned your company every time someone talks about a “home improvement” project! I guess that is the way I show my appreciation. Everyone was friendly, professional and oversaw each job to make sure it was done to our satisfaction even going the extra mile. I really appreciate how responsive Keith Construction - T&H Electric is to requests. Our business was moving and we needed an outlet changed out in order to use our new office copier/scanner. They worked with us and solved the problem in time for us to move in as planned. I assigned the task and it got done without a lot of further hassle from me. The associates with Keith Construction and T&H Electric are responsive, very competent, honest and we are thankful to have them nearby. A hands-on approach company, willing to work with customers. Great Crew. Professional, efficient and helped us make good decisions on the work we wanted to do. Your entire crew is so polite and considerate, on top of doing great work! You are the only people I ever call for home repairs/issues. So good to have a crew who are very professional and clean. I recently converted a garage/basement area into a laundry room/bathroom, mudroom, and bedroom. This challenging project was completed ahead of schedule; I was impressed with the attention to details and general workmanship! I love to show the new rooms to my friends and hear their “ohs” and “ahs”. I have recommended T&H many times! Thanks for a job well done! The best has been that we can count on you to do high quality work and to be here when you say you will. It’s also very easy to communicate with the office, the crews have been wonderful to work with, and the whole process from bid to completion is straight-forward. I also think that both the office and crew handle questions and concerns very well. 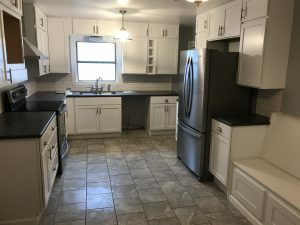 This was my first experience with a substantial remodel. I loved being able to ask any question, either to Ethan or Eric, and receiving a timely, professional response. They and Nathan were professionals through and through in the office and on the job. Each question had an answer and I was made to feel very much a part of the project. My design and later suggestions were taken seriously and implemented. I had no idea a one car garage turned bedroom and adjacent miscellaneous room could look like a brand new building. Our home is very old and required a lot of work. Eric joked we were attempting to make a “silk purse out of a sow's ear.” That was the truth and also exactly what happened. The experience was excellent and absolutely stress free. I love that I have clients come to the salon, comment how beautiful it is, ask who did the work and then say they are not surprised it is the work of Keith Construction. Favorite part of doing business with you: Quality workmanship and willingness to address any worry I might have. There were a couple places that weren’t to my liking, they were cheerfully addressed immediately! Impressive! High quality work, fair price, and nice people. You answered my call and were willing to do a small job. Your crew was so polite and friendly! We are thankful to have such great people to call upon! Your company is so courteous, professional, and responsive. I really appreciate your attention to detail and how easy it is to communicate with all members of your team. Our favorite part was the promptness of repair and friendliness of staff. Appreciated the amount of communication and follow through. Would definitely use your service again! You are prompt and on schedule. My phone calls and e-mails were returned in a timely and very courteous manner, and workers arrived when promised. Everyone was very professional, friendly and always ready to address unexpected issues or concerns. This really sets you apart from a great many businesses in my experience – especially my experience trying to find someone to do this particular job!! Always dependable, professional and timely work done with better than I hoped for result. Workers are positive, glad to be doing the work attitude which we all should have in life. [They] were perfect gentlemen. They worked so hard each day. It was a pleasure to have them in our house. They were very professional and neat and tidy. I would certainly have them again. I also will recommend them to any of my friends who need work done. They always called if they were going to be detained. I am so pleased with the work that was done and I have expressed my satisfaction with my friends. Thanks again for a very pleasant experience. Eric was very friendly, arrived on time. Your company kept us informed of everything and took time to make sure all was right before leaving. The work was more and better than I had anticipated. The creative way unique problems were solved was refreshing and gives me confidence to consider additional work. Easy to work with and great communication. You are available when we need you. Thanks. Always on time, very friendly staff, and solid work for fair price. When the job got started you were on it. We were kept informed all along the way. Everyone is always very polite and helpful, and the work was done with expert care. I so appreciate the way that your team slowed down to explain things to me. They were amazing at helping me understand the problem and what the possible fixes were. One of the tasks was to replace bathroom ceiling fans. After evaluating both fans, the team determined that one didn't need to be replaced after all and the other was only poorly vented and would still be usable once vented appropriately. They helped guide me into the less expensive (and more appropriate) fix... I know that this is excellent example of how ethical your team is. These gentlemen wanted to do the right thing for the customer and resolve the problem. Eric and Rob were stellar examples of professionals who take their work product very seriously. They treated me and my home with incredible respect. I have felt “talked down to” many times with people working on the house... those folks should take lessons from these two professionals. You have two real gems in these team members. Eric replaced a bathroom fan/light. He showed up on time which is unusual these days for people who come and do work in your home. Also, I was impressed that Eric put heavy paper on the floor to protect the vinyl and to capture the dust and debris that fell when he pulled the fan from the ceiling. The work happened while I was out of the house and when I came back, the only evidence that Eric was there was the new fan in the ceiling. Not dust, no box or old fan to throw away, no little bits of wire. I will call these guys again for electrical projects! I knew we would be treated fairly and not taken advantage of. The completed work turned out great and we are very happy with it. The crew members were always polite, friendly, and good to talk to. The way they communicated and showed interest in the project really added to my confidence in their work. Many thanks!!! Professional, friendly, and excellence in job. Always quick to get here to do whatever we need done. You all are consummate professionals. I felt like we were able to brainstorm some solutions together, with expert input from your team member! Everyone behaved in a professional manner, worked hard and always happy to help. I was particularly impressed with the pride each person took in the quality of their work. Eric did great work & communicated well as we planned the work. The electrician was extremely knowledgeable, polite, efficient, and professional. He finished ahead of schedule and left the house cleaner than he found it. Friendly, professional staff who arrive on time, complete work on schedule & leave site neat & clean. The gentlemen that did the work were the most polite people. They cleaned up very well. They are welcome to work on our home any time. It turns out that a breaker had been flipped to the off procedure. Eric could have done many things. However, he demonstrated his integrity by telling us the problem and even apologizing because there was nothing to repair, only a switch to flip. I told him it was worth the cost just to give us a peace of mind about what could have been a greater problem. By doing this, Eric reaffirmed our trust of your company. We have had several things done by T & H Electric. Be assured, we with call T & H Electric for any future electrical needs. Favorite part of doing business with you, aside from the fact that the work was done beautifully, the gentlemen were wonderful to work with. Very eager to please and terribly neat in their work. It was a positive experience in every way. Excellent work and pricing, can't find better! Knowledgeable, communicated effectively, liked to work ethic – come “on time”; friendly; worked “right along”; left when done. The ease with interacting with all the employees. Very prompt and courteous. Attention to detail. Excellent work. Courteous workmen who are skilled and adaptive. I am very pleased with their work. We liked the promptness and pleasantness of the crew. Favorite part of doing business with you: Ability to adopt to the jobs needs. Quality Human Beings. Favorite part is the quality of work. It is always a pleasure doing business with you. Our needs are taken care of in a professional and timely manner. Thank you! Work was done in a timely manner, Eric was careful and cleaned up the work area. Great company & good competent people. The two young men that did my work were so nice and polite. They were a pleasure to have in my home. My favorite part of doing business with you is looking at Eric's artwork. My favorite part of doing business with them was their completing the job very quick and friendly. Our favorite part of doing business with you: 1) Your people. They are all great. 2) The quality of the work is outstanding. My favorite part is knowing that I can go to work without worrying and have the confidence that your staff will get the job done right. Favorite part of doing business with you: All of your employees! You are all great. Plus the end result of your work; we are always happy with the work. We can always trust that the job will be taken care of in a professional and timely manner, with friendly and courteous personnel. All the crews were very well trained, polite, friendly, they worked efficiently and the work done on my house was high quality. Just a note from a very satisfied customer . . . I confess that I am a huge fan of HGTV and probably get a few of my ideas from them. They have Flip or Flop (w/Tarek and Christina), Love it or List It (Hilary & David), Property Brothers (Jonathan & Drew) and Fixer Upper’s (w/Chip & Joanna) . . . I told you I was a big fan! But they don’t have T&H Keith Construction, their loss . . . our gain! Your staff is great to work with on a home improvement project. You make your customers feel as if you are their very own exclusive consultant. You share and give advice when needed, your staff works efficiently and completes their projects as promise. Plus, your work is guaranteed! Who needs HGTV when we have T&H!